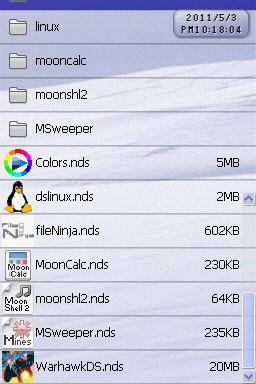 Folder name '/shell' was changed to '/moonshl'. 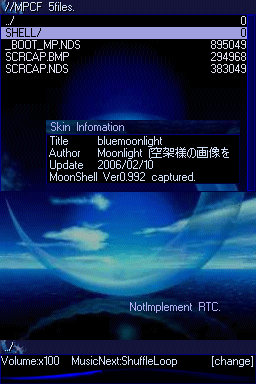 Skin folder name '/shell' was changed to '/moonshl/skin'. file name 'global.ini' was changed to 'moonshl.ini'. All disk driver changed to DLDI. The MoonShell message supports the multi language. When skin.ini is selected, it is skin reload. Removed functions at 'IMFS/EXFS/GBFS file system interface'. The system menu was added. 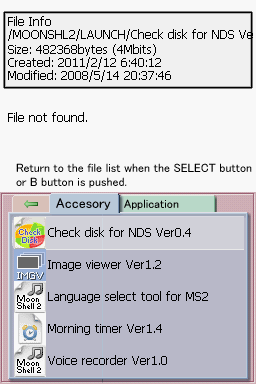 An environmental setting is revokable in NDS. Simple binary viewer was added. 'The L/R button is locked' item was added to the system menu. Restore when the last folder is remembered, and it will start next time. The StartPath item was deleted from the [System] section of 'moonshl.ini'. 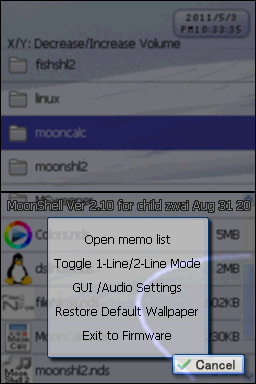 'Change backlight bright' was added to the system menu. The bug to which the plug-in system had been doing an important violation of the memory access was corrected. Supported to the MSE plug-in. Supported to the MSPV50 (Sound effects) plug-in. Enabled interpolation processing ratio is '31%, 37%, 43%, 62%, 75%, 87%, 125% and over'. Ignored '25%, 50%, 100%'. The enhancing memory can be used by the PNG plug-in. Update to 'Game_Music_Emu 0.5.2' for NSF/GBS/HES/AY/SAP/KSS. The number of tracks of NSF version 2 can be acquired. [GMEPlugin] section was added of global.ini. Supported to the TTA plug-in. The memory leak bug of the OGG plug-in was corrected. Supported encode type to UTF-8 and UTF-16LE and UTF-16BE. Supported to English word wrap by the text plug-in. The text plug-in can have displayed on both screens. The text scroll lines count can be specified with the manual. The bug to which the memory access violation was done with DPG decoding was mended. The number of file reading buffers of the DPG reproduction has been expanded. The same name as DPG file. '.bmp/.jpg/.png' file was found. CreateThumbnail.exe makes the thumbnail. Moreover, it was changed variously in a small point.